... this ceiling lamp reminds us of them. 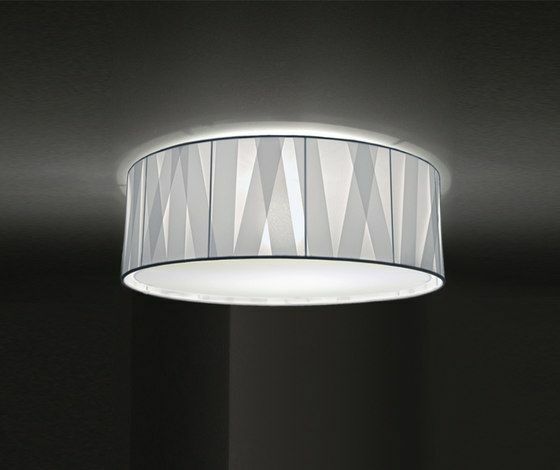 ceiling lamp, 1x E27, diameter 60 cm, ribbon, color: WHITE and Stretch-fabric, color: WHITE, height: 21 cm, shade: Ø 60 cm, mounting fitting, color WHITE, for use of LED-retrofit-lamp and energy saving lightbulb, E27: max. 1x 24 Watt, ~ 400 – 1500 lumen This product is compatible with lamps belonging to energy classes: A++,A+,B,C,D,E Energy classes on a scale of A++ (highest efficiency) to E (lowest efficiency). Since its inception in the year 2005, the company Bernd Unrecht lights has been designing, making and selling decorative lighting fixtures for homes, with a timeless classical approach and elegance of form.